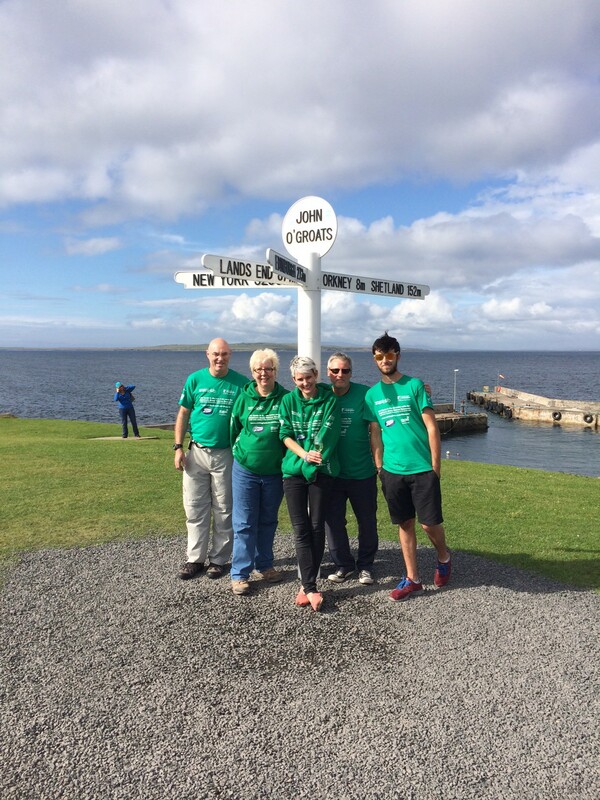 At 14:40 we arrived at the place where the first Life Cycle began, John O’Groats. After 1,370 miles and more than 60,000 feet of climbing we reached our fourth corner and the end of our challenge. There were tears of joy and relief, there was elation, there was satisfaction. We had made it. We left Tongue in two groups: Chris J, Karen, Marion, Nieves, Steve, Susan and Svenja were away at 07:30. I had actually got the blog completed a bit earlier, but internet access was a real problem and it took a while to post. Everyone else wanted a cooked breakfast, which was not available until 08:00. So I left at 08:40 with Nick, Esteban, Doug, Andy, David W, Chris R, Penelope and our leg rider Bob Bayman; but not before I had cleared my bike of a neighing hobby horse, a knight’s shield and swords, a knight’s cape and a gladiator’s cycling one piece. A traditional final day set up for me. We were promised rain. Happily the forecast was wrong. It was dreech, not raining, but misty and damp. The first 30ish miles through to Dounreay was constantly up and down, with some long pulls. This was not going to be a gimmie of a final day, it was hard going. But riding up and down in cold mist is preferable to doing it in driving rain. The Dounreay Nuclear Power Station is about 10 miles from Thurso, but it is pretty well all downhill. 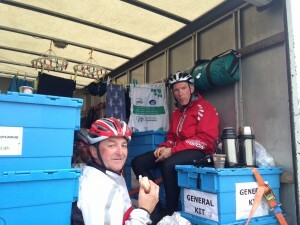 So we got there fast, met up with everyone else at a bakery in the centre of town and stoked up on pies for the run in. After a hard morning, the end was in sight. The final 20 miles was fast, partly because the terrain changed completely and was pretty flat. We were also sheltered by massive sand dunes, and the sun was now smiling on us. And it was the final 20 of almost 1,400 miles, so it was second winds all round. 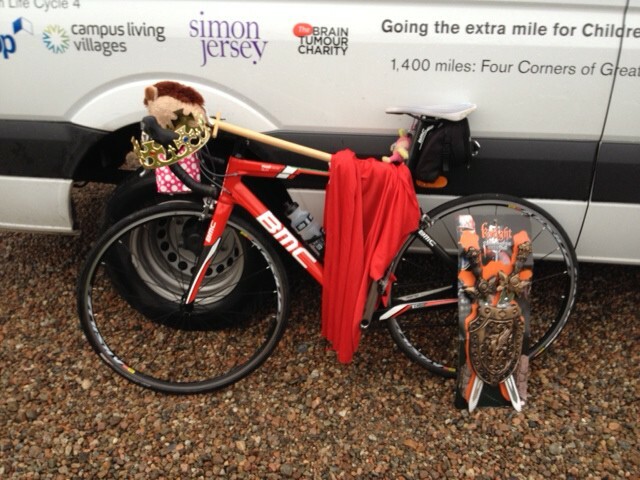 Before you knew it we were lining up in Huma just outside John O’Groats for the finish. There was no sense of anti-climax, far from it. By now it was a warm sunny afternoon. The Support Team had set up a finishing line and Susan, David R, Ottilie, David’s son and niece, Bob Bayman, Susan’s friend and other well-wishers clapped us in. Susan had brought champagne; that was today’s recovery drink. There was relief, elation and pride. We had an hour taking pictures, drinking champagne and savouring the moment. Then it was into the minibus to head for Perth where we are staying overnight ahead of a flight from Edinburgh to get to the LC4 Community Day. Our journey was broken in Inverness where we ate at an Indian restaurant called Cinnamon. It was the best dinner in weeks. Since the whole team was together for most of the day, I have some nice ‘Quotes of the Day’ and team updates. But they are not for today. This will be my final blog post of the LC4 ride. So, I will use my remaining words to reflect a little on this challenge and the people who have risen to that challenge. I think it was on my Day 2 blog that I wrote ‘this time is different’; it felt that way then, and it has been. When I opted for this cause, I knew it was truly compelling, and meeting so many people on the road over the last 17 days whose lives have been touched by this disease, combined with the interest we have had from passers-by, confirmed that on a daily basis. And it is the case that riding in honour of individual children has made the whole thing that bit more personal. In addition we had in our team a Doctor who looks after children struck by this disease, and the Father of a child who did not make it. They taught us a lot, more than they realise. I write this whilst in a very quiet minibus, on the A9 between Inverness and Perth. Everyone is exhausted, physically and mentally. There is not a single conversation taking place. This has been a really tough challenge, not just because of the sheer distance, but also because of the demands of terrain and intensity of our schedule. It has been an amazing journey. Fifteen riders took it on. Even for those who had completed one or more Life Cycles (and we had five who have completed all four – Karen, Chris R, Nick, Esteban and I) it was a step up. For the new riders, three of whom did not even possess a bike when I approached them about joining the team, it was a real leap in the dark. This has been a special team which bonded quickly and got on with the job day after day, with resilience, single mindedness and good humour. I am proud to have done this with them; I am proud to lead an organisation they work for or are associated with. But we were just the delivery end of this operation and could not have done it unassisted: routes were planned, accommodation booked, events organised along the way, without us having to do anything. So a big thank you to the logistics team, and to Sarah Hyde who ensured the blog was posted on a daily basis, whatever the day. Then, on the road, in Helen, Paul, Andy and Adam we had a Support Team which was ever present, professional, skilled and engaging. 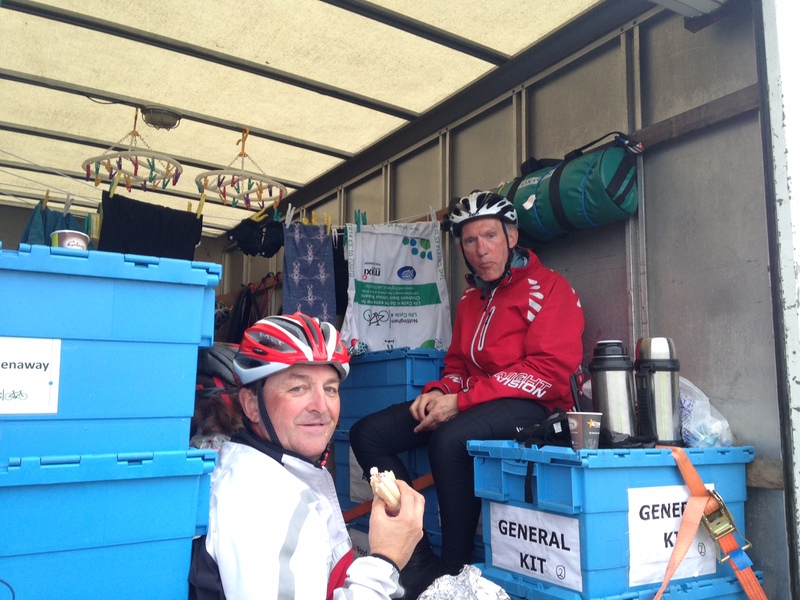 They had long days managing 15 riders, maintaining their bikes, cheering us up, moving us on. They are an outstanding group of people. 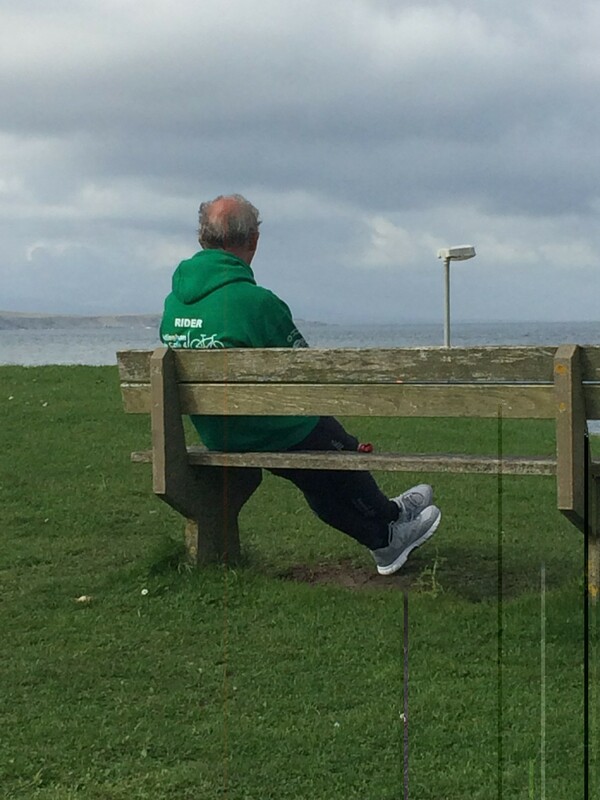 We are now at almost £590,000 raised for the Children’s Brian Tumour Research Centre, and this total will move on in the coming weeks as it benefits from a number of follow-on events. This will make a difference, of that I am in no doubt. Thank you to everyone who has supported us, both our lead corporate supporters and the literally thousands of individuals who have contributed. Tomorrow will be different. I will still have to get up early to finish this blog, and we will still be at breakfast in our kit. But, today is our LC4 Community Day and the only riding we have to do is from one part of University Park to another. We are excited about joining that event and seeing those who have joined in the day’s cycling challenges. We are also looking forward to seeing our friends and family, so many of whom we have not seen for two and a half weeks. After the Community Day tomorrow, the bubble will burst and we will go back to our day jobs and another kind of routine. We been driven by a common purpose, have shared a lot of pain and a lot of laughs these past weeks, and have memories to share in the future. Above all we have the satisfaction of knowing our efforts will help make a difference to our children. So that’s it from the LC4 ride itself. Tomorrow I will make a final post after the Community Day. Congratulations to each and every one of you on another fantastic achievement and for bringing such focus and energy to such an important cause. On behalf of UNNC (since our dear leader is with you and part of the incredible team effort) I will raise a wee toast to you all this evening. Enjoy every minute of the community day; sorry not to be with you but we have thousands of new students starting another kind of amazing journey tomorrow morning …. Very well done to everyone from here in Beijing. A wonderful achievement and, as David says, a real step up from previous years. I have enjoyed reading the Scottish legs, a bit like deja vu in reverse. I do remember those hills though!!! Hope the community day goes well and then you enjoy a bit of rest. Congratulations all. Congratulations to each and every one of you. What a fantastic achievement to finish 1400 miles. Well done, everyone. It’s been great to follow your progress every evening. Many congratulations to all. Outstanding achievement. Very nice blog post to end a fantastic achievement. I can’t even begin to imagine the highs and lows of this bike ride. I can only add Wendy and my deepest congratulations to everybody on the team. A magnificent effort and a magnificent achievement. Look forward to seeing you all soon. Really proud of you all – just a remarkable achievement. Congratulations to all! A quite incredible achievement. The 50 mile challenge yesterday really drove home some of what you’d faced. The thought of having to get back on and repeat it the same day and then again every day for 2/52?!! Wow. Well done to you all. Good effort. Congratulations to everyone in the team from Rangoon, Burma! Huge congratulations. Everyone concerned should be incredibly proud. This event and achievement reflects something of the ethos of the university more widely – accepting challenges and demonstrating compassion. I hope more donations pour in for this worthy cause. The blog has given a great flavour of the progress. Congratulations once again. I am in total awe especially after taking part in yesterday’s 75 mile lifecycle and feeling the effects today. How you managed to do longer and harder distances consistently is inspiring and a little bit mad! Enjoy your rest and the plaudits you have earned. This cause is incredibly worthwhile and you will have made a huge difference to children with brain tumours. 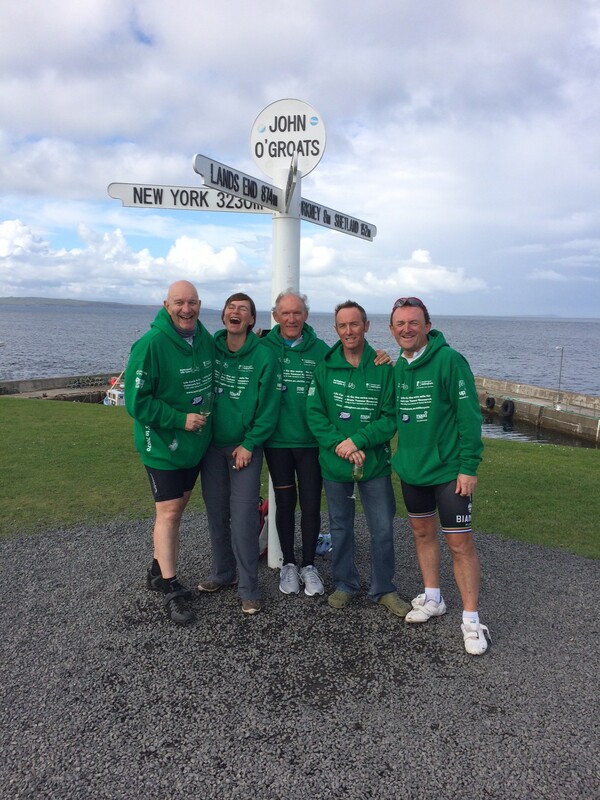 Congratulations to the Life Cycle 4 team on this awesome achievement. You and your families and the families you rode for must feel such a sense of overwhelming pride. I’m please there are no further reports of injuries or tumbles today and even more relieved to know there have been no (recorded) nosebleeds! Thought for today: studies have shown that riding a bicycle every day makes you more awesome than the general population. … You truly have proven this is so. May the elation and pride you felt in John O’Groats live long in your hearts. Congratulations to you all on your amazing personal achievement, and on all the money you have raised for such an important cause. With the greatest of admiration, hope you’re all enjoying some rest, great pride and satisfaction!